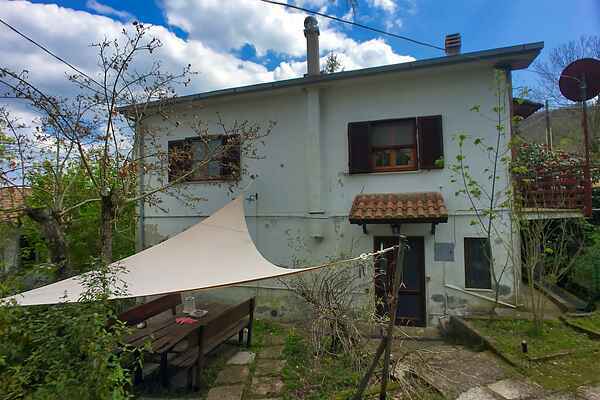 This beautiful holiday home for six people is located in a sixties villa and is part of two apartments, situated in the hills of Sassetta at an altitude of 500 meters, 12 kilometers from the beach and from a beautiful botanical garden. You enter the apartment through the garden, leading you directly into the kitchen. The home is cozily decorated and the matching furniture completes this charming ambience. You can sit outside with a drink and a Tuscan meal prepared in the wood oven or on the barbecue. Or you can look for some refreshment in the shade of the chestnut trees. Shops and a restaurant can be found in Sassetta, 1 kilometer away. For a day of sun, sea and sand travel 12 kilometers to Marina Castagneto Carducci. Shops and a restaurant can be found in Sassetta, at 1 km distance. This garden is only open to guests and well worth a visit. Culture lovers can indulge themselves in the beautiful cities of Pisa, Lucca, Piombino, Livorno and Grosseto.